In a new documentary, US government agents claim they spent decades giving fake evidence of extraterrestrials to gullible ufologists. But why? And how can we trust them now? idden among the avalanche of documents leaked by Edward Snowden were images from a Powerpoint presentation by GCHQ, entitled The Art of Deception: Training for a New Generation of Online Covert Operations. Images include camouflaged moths, inflatable tanks, women in burqas, and complex diagrams plastered with jargon, buzzwords and slogans: “Disruption Operational Playbook”, “Swap the real for the false and vice versa”, “People make decisions as part of groups” and, beneath a shot of hands shuffling a deck of cards, “We want to build Cyber Magicians“. Curiously, sandwiched in the middle of the document are three photographs of UFOs. Not real ones – classic fakes: one was a hub cap, another a bunch of balloons, and one that turned out to be a seagull. Devout ufologists might seize upon this as further proof that our governments “know something” about aliens and their transportation methods, but really it suggests the opposite: the UFO community is a textbook case of a gullible group susceptible to manipulation. Having spent too long watching the skies and The X-Files, it’s implied, they’ll readily swallow whatever snippet of “evidence” suits their grand theory. If there really is a UFO conspiracy, it’s surely the worst-kept secret in history. Roswell, Area 51, flashing lights, little green men, abductions – it’s all been fed through the pop culture mill to the point of fatigue. 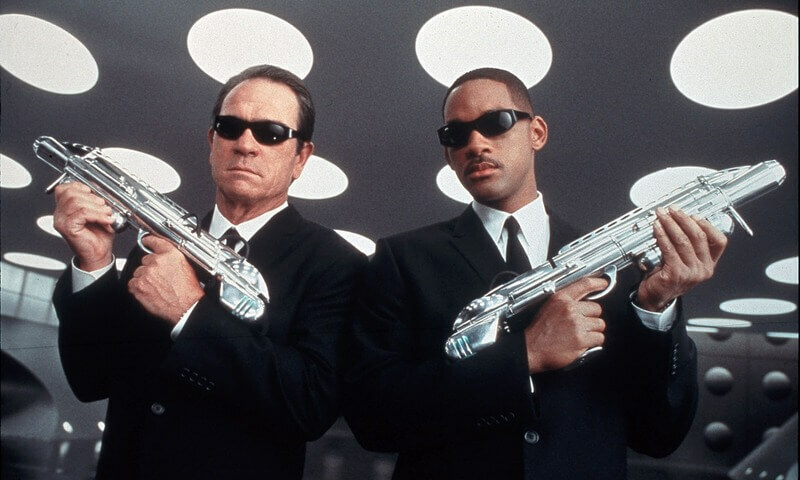 Even the supposed enforcers of the secret, the “men in black”, have their own movie franchise. But a new documentary, Mirage Men, unearths compelling evidence that UFO folklore was actually fabricated by the US government. Rather than covering up the existence of aliens, could it be that the real conspiracy has been persuading us to believe in them? Richard Doty … deceived UFO spotters. Mirage Men’s chief coup is to land an actual man in black: a former Air Force special investigations officer named Richard Doty, who admits to having infiltrated UFO circles. A fellow UFO researcher says: “Doty had this wonderful way to sell it – ‘I’m with the government. You cooperate with us and I’m going to tell you what the government really knows about UFOs, deep down in those vaults. '” Doty and his colleagues fed credulous ufologists lies and half-truths, knowing their fertile imaginations would do the rest. In return, they were apprised of chatter from the community, thus alerting the military when anyone was getting to close to their top-secret technology. And if the Soviets thought the US really was communing with aliens, all the better. The classic case, well-known to conspiracy aficionados, is Paul Bennewitz, a successful electronics entrepreneur in New Mexico. In 1979, Bennewitz started seeing strange lights in the sky, and picking up weird transmissions on his amateur equipment. The fact that he lived just across the road from Kirtland air force base should have set alarm bells ringing, but Bennewitz was convinced these phenomena were of extraterrestrial origin. Being a good patriot, he contacted the Air Force, who realised that, far from eavesdropping on ET, Bennewitz was inadvertently eavesdropping on them. Instead of making him stop, though, Doty and other officers told Bennewitz they were interested in his findings. That encouraged Bennewitz to dig deeper. Within a few years, he was interpreting alien languages, spotting crashed alien craft in the hills from his plane (he was an amateur pilot), and sounding the alert for a full-scale invasion. All the time, the investigators were surveilling him surveilling them. They gave Bennewitz computer software that “interpreted” the signals, and even dumped fake props for him to discover. The mania took over Bennewitz’s life. In 1988, his family checked him into a psychiatric facility. Doty almost admits to having had a hand in supposedly leaked “classified” documents, such as the “Majestic 12” dossier – spilling the beans on a secret alien liaison committee founded by President Truman. But he denies involvement in the “Project Serpo” papers – which claimed that 12 American military personnel paid a secret visit to an alien planet in the Zeta Reticuli system – only to be caught out as the source of the presumed hoax. The Serpo scenario, it has been noted, is not unlike the plot of Steven Spielberg’s Close Encounters Of The Third Kind. Does that suggest that the forgers lazily copied the movie? Or that the movie is based on real events and Spielberg was in on the conspiracy? The place of movies in the grand UFO conspiracy is a tricky area. Depending on which theory you subscribe to, Hollywood’s steady stream of sci-fi is either a deliberate exaggeration, designed to make the “truth” look unbelievable (the “you’ve been watching too many movies” defence), or it’s a way of psychologically preparing the populace for staggering alien secrets yet to be revealed. There are at least grounds for suspicion in the latter camp. Pilkington points to the CIA’s Psychological Strategy Board, founded after the second world war to promote US propaganda. Associated with the board was veteran film producer Darryl Zanuck. In 1951, Zanuck executive-produced seminal alien-visitation sci-fi The Day the Earth Stood Still, often cited as a government-sanctioned testing of the waters for alien contact. Like Zanuck, the film’s writer, Edmund North, was ex-military, while director Robert Wise apparently became a UFO believer on account of discussions he had with Washington figures during the making of the movie. Steven Spielberg is a less likely government stooge, though he has been obsessed by aliens his entire career, from Close Encounters and ET up to War of the Worlds and the last Indiana Jones film (not forgetting his producer role in Falling Skies, Transformers and, er, Men in Black). If anyone’s paving the way for the big reveal, it’s Spielberg, but, after 30 years of paving, we’re still waiting. Mirage Men finds an even more extreme example in the form of industry veteran Robert Emenegger, who claims that in 1971 he was approached by the Pentagon to make a film revealing “what the government really knows”. The Pentagon’s big lure was that they would let him incorporate top-secret footage of an alien craft landing at Holloman Air Force Base in the 1960s. Predictably, the footage never materialised but Emenegger – no less cryptic a character than Richard Doty – claims to have seen it, and still believes alien contact has been established. He went ahead and made his documentary, entitled UFOs: Past, Present And Future. Presented by Rod “Twilight Zone” Serling, it culminates in a rather anticlimactic “reconstruction” of the Holloman UFO landing. In the cold light of the post-cold war, the evidence is starting to look pretty shaky for UFOs. Numbers at UFO conventions and clubs are dwindling. The UK’s Ministry of Defence closed its UFO desk in 2009, and, like many countries, has declassified its UFO documents. If there was any smoking gun, you’d imagine it would have been found in our current golden age of leaks and disclosures – but so far there’s only been more smoke. On a Guardian webchat in 2010, relating to Wikileaks’ release of the US embassy cables, Julian Assange asserted that “many weirdos email us about UFOs” but he’d come across nothing concrete. There were references to UFOs in the cables, he noted, but mostly to do with UFO cults rather than UFOs themselves – in the same way that GCHQ’s Art Of Deception slideshow references UFO cults. If nothing else, the leaked GCHQ document tells us the Mirage Men are still out there, sowing deception and disinformation. These days they’re more likely to be targeting suspect extremist religious groups, or hackers and online fraudsters. Meanwhile, recent claims to have “deciphered” hidden backwards messages about UFOs in Edward Snowden’s interview only go to show how desperate the alien conspiracy cause has become. There’s something else ufologists are a textbook example of: cognitive dissonance – the mental distress of trying to hold two conflicting worldviews simultaneously. The term was coined in the 1950s by psychologist Leon Festinger, who illustrated it with the example of a UFO cult shattered by the unfulfilled prophecy of an alien visitation. Some tenacious devotees still refuse to accept Mirage Men’s findings, says Pilkington: “If beliefs are strongly held, nothing can sway them and anything that appears to undermine them will just be absorbed and repurposed. So if you’re really, really dedicated, this is just chaff to throw you off the trail.” Pilkington himself has been accused of working for MI5 or being a stooge controlled by the government, if not the aliens. “If I’m under intelligent control from elsewhere then I’m unaware of it, and I’m a victim, and it would be against my programming for me to be able to prove it,” he reasons. As always in the conspiracy-theory hall of mirrors, it’s possible to flip the hypothesis on its head: what if the lies and hoaxes Mirage Men reveals are simply a smokescreen for the fact that the authorities really do know secrets about extraterrestrials? What better way to conceal them than by getting “found out” in their disinformation tactics? What better way of throwing sceptics off the scent than disseminating the confessions of an ex-man in black like Richard Doty, in documentaries, and articles in respectable new organisations – like this one. Perhaps we’re no closer to knowing if the truth really is out there, but we can be sure the lies are.